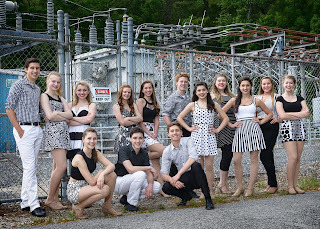 Following a three-and-a-half week summer concert tour of Austria and Italy, Electric Youth (EY) will perform two free outdoor concerts on Thursday, July 21, at 6:30 p.m. at Norfolk Town Hill and on Wednesday, July 27, at 6 p.m. on Franklin Town Common. The Franklin concert will be presented as part of the second annual Franklin Cultural Festival, hosted by the Franklin Cultural District Committee. Electric Youth’s 13th European tour was highlighted by a return Fourth of July show at Aviano Air Force Base to entertain U.S. Troops and families stationed abroad, as well as a concert at the American Embassy in Rome. The 2016 tour also featured performances in Vienna, Kirchberg, Gmunden, Melk and St. Polten, Austria, including a benefit concert for pediatric cancer and patient family support. Performances in Italy included multiple shows in Lignano, Bibione and Concordia along the Adriatic Coast, concerts in Todi and Cortona within the Tuscany-Umbria region, and at Lake Como. Backed by the eight-piece band of world-class musicians, Electric Youth delivers a fun, high-energy evening of family entertainment with an extensive range of contemporary pop, classic rock, Broadway and country hits for audiences all ages. This season’s repertoire features fully choreographed performances of the best of Adele, Beyoncé, The Black Crowes, Imagine Dragons, Michael Jackson, Bruno Mars, Pink, Queen, Frank Sinatra, Carrie Underwood, Stevie Wonder and more. Selected annually by audition, the group is chosen for superior musicianship, stage presence, and “triple threat” accomplishments in voice, dance, and acting. This season’s ensemble of performers, ages 14-18, studies multiple dance disciplines, voice, and acting at the Franklin School for the Performing Arts (FSPA). Electric Youth 2016 includes Madison Asgeirsson, Brooke Collins, Aaron Frongillo, Jocelyn Jones, Lauren Szczepanowski and Melissa Wyner of Franklin; Michael Fajardo of Hopkinton; Sam Evans and Colie Vancura of Medfield; Katie Gray of Milford; Kylee Rollins of North Attleboro; Griffin Wilkins of Walpole; and Jenna McDermott and Susauna Wickstrom of Wrentham. Showcasing Boston musicians who’ve performed, recorded and toured with such music legends as Tony Bennett, Aretha Franklin, Dizzy Gillespie, B.B. King, Diana Ross, The Temptations and Van Morrison, EY’s show band features Kenny Hadley on drums, Arnie Krakowsky on tenor saxophone, Bill Miele on bass, Artie Montanaro on trombone, Walter Platt on trumpet, Ken Reid on baritone saxophone, Mark White on guitar and Director Raye Lynn Mercer on piano. Under the direction of Mark Poniatowski, musical arrangers for Electric Youth are Rick Hammett, Jeff Perry, Walter Platt, Poniatowski, Mark White and Ben Whiting. Hallie Wetzell is Electric Youth’s Vocal Director. Choreographers include Mercer, Casey Andrade, Cheryl Madeux, Nick Paone and Kellie Stamp. Electric Youth has released six professional CDs and performed internationally at England’s Arundel Festival, Disneyland Paris, professional theaters in Bristol, London and Windsor, and such renowned venues as Sanremo’s Ariston Theatre and Vienna’s Konzerthaus, Musikverein and Schonbrunn Palace. EY has also headlined Fourth of July shows for U.S. troops and their families stationed in Italy at Camp Ederle, Camp Darby, and Aviano Air Force Base. The ensemble has performed on Royal Caribbean’s Oasis of the Seas, on Fox-TV and WBZ Radio, and at Fenway Park, Gillette Stadium, Mechanics Hall, the Smithsonian Museum Theater and the United Nations. EY’s music, including the 2014 album Power Chord is available at amazon.com and iTunes. For more information about Electric Youth or the EY summer concerts, call FSPA at (508) 528-8668 or visit www.electricyouth.com.